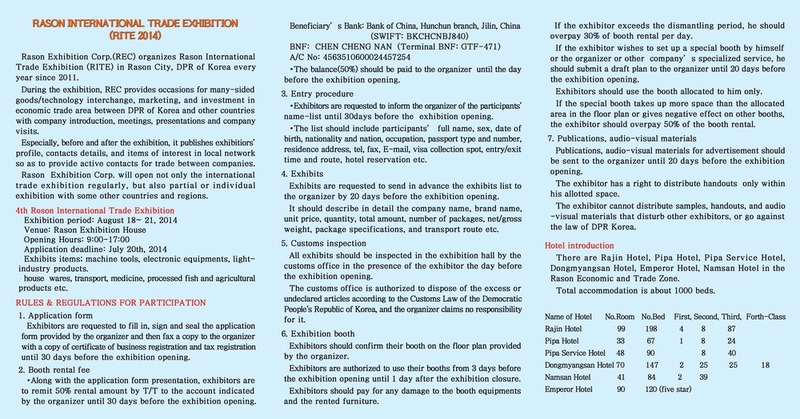 4th Annual Rason Trade Fair Dates: August 18th to 21st — Choson Exchange - Visit North Korea & Support Local Entrepreneurs! Choson Exchange, in cooperation with Hanns Seidel Foundation, just conducted the first ever economic workshop in Rason. More on that soon. For now, another first (at least as far as my google-fu can reveal): we can announce the dates of the 2014 Rason Trade Fair, set for August 18th to 21st. Interestingly, this was among the many issues we covered when it comes to investor relations during our two-day program: people need more than 6 weeks to prepare for a trade fair. Six weeks! That's tough enough to plan travel, much less plan a decent booth. Regardless, hot off the presses is their flyer, reproduced below. Feel free to print and fold accordingly.